May, 1982 ended the life of one of America's most notable and listened to radio news announcers. 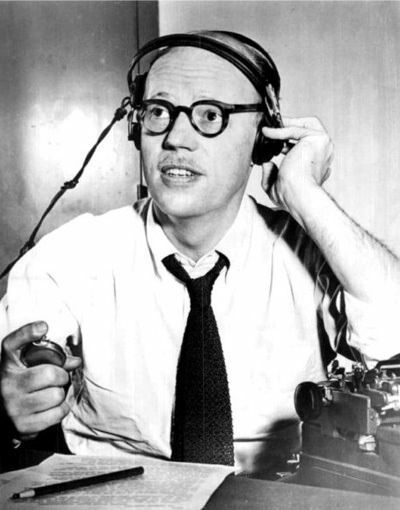 Frank Singiser is probably best known as a night-time news announcer for NBC during the 1940's and WWII. He also was on-board one of the famous Kennedy-Nixon debates in 1960's as a panelist. His credentials expanded through almost 5 decades, beginning with his work in 1920's as an announcer for a local station in Schenectady, N.Y. He spent a considerable amount of time with the Mutual Broadcasting system, and was deemed an unlikely choice tbe that position. Why? Maybe it had to do with the fact he spent the 1930's as an announcer for programs like Your Hit Parade and voice-overs for commercials such as Lucky Strike. Yet, that was the way of many voice talents of that age...waiting for one chance to show they had the stuff to work the big time. The Singiser Headliners was Frank's program, sponsored by the Associated press. In this night's program he is excited in that America was making successful progress in the European theater. American forces were making headway in Saint Lieux in France showcasing a 'miles rather than yards' approach. Also British and Canadian forces made breakthrough near Cannes France. His oratory was a mixture of facts and foresight picturing the possibilities that lay ahead for the allied forces after having hit the beaches at Normandy and gaining the ground. Sponsored by BC Headache Powder, Frank proudly gave the news of the American push in Belgium, the air power that was raining down on the Nazi's and Germany was feeling the pressure. The news was not good as Germany was seeing some advances in a pushback, but those were sporadic locations. All in all, the Allied Forces were making positive headway as the Russians were advancing onto Hungary to battle the Nazi encampment. He also gave perspective of what was happening in the pacific war on Japan. This was the typical approach of Singiser giving the whole perspective and not just the flowery news to boost morale. Frank Singiser was a popular voice to millions of Americans that sought to stay abreast of what was happening in the war. His time as a newscaster and commentator is his most remembered aspect of his career. That is probably most fitting as Singiser ahd the perspective this was the important saga of human history. He played a huge part in that saga and Americans remember him for being the voice of balance. Be the first to comment on "Frank Singiser News Announcer"